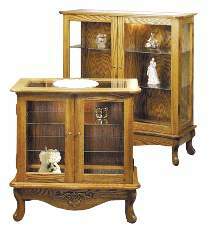 #W2192 Measures 30"H x 29"W x 15"D. #W2211 Measures 42"H x 40"W x 14"D. Both plans use the #1251 Hardware parts package which contains non-mortise hinges, cabinet knobs with magnetic catches, shelf supports, embossed oak ornament, and a cabinet light with bulb. The project plan, glass, wood, and wood finish are not included. Save with the #1252 Special for the 30" Cabinet or the #1729 Special for the 42" Cabinet which includes the plan and hardware.